Apttus Contract Management is a world-leading solution when it comes to contract life-cycle management. The application, which is powered by artificial intelligence, allow legal officers to become consistent and efficient in managing contracts throughout their life cycles. Apttus Contract Management enables teams to meet organizational goals while maintaining the feasibility of contracts, increasing deal closings, and reducing expenses. The solution allows organizations to look forward to smoother workflows and enhanced earnings. With Apptus Contract Management, businesses and non-profit organizations can reduce and mitigate risks in little to no time. On top of that, the solution facilitates the swift drafting of agreements and the improvement of negotiations. Because it is powered by an AI assistant, Apttus Contract Management is able to provide its users with a conversational experience. With Max, users can input information into the system as if they were speaking with another person. Max is also accessible as users can talk to the AI on various channels including Skype, Slack, and SMS. This enables users to update and create irresistible contracts. With Apttus Contract Management, teams can streamline their processes and be more efficient. Max assists them in avoiding bottlenecks in the workflow and aids in the reducing the time to reaching the signature signing stage of the contract. This is enabled by the solution’s intelligent cycle time prediction founded on the organization’s approval workflow. Apttus Contract Management helps organizations in reaching their ROI goal at a faster rate. It does so by facilitating the importation of old contracts to the new system. This lets users effectively manage renewals, compliance needs, and risk mitigation in case the need for it arises. Slow contract creation and approval can lead to loses in sales. That is why Apttus Contract Management aids legal teams in generating contracts and ensuring that they are up-to-date. This allows sales teams to deliver their quotes and contracts faster to their clients and lets them close more deals in a shorter span of time. If you are considering Apttus Contract Management it might also be sensible to check out other subcategories of Best Contract Lifecycle Management Software gathered in our database of B2B software reviews. Since each organization has unique business wants, it is advisable for them to abstain from looking for a one-size-fits-all faultless software solution. Needless to say, it would be futile to try to find such a system even among market-leading software solutions. The clever thing to do would be to list the various vital elements that require consideration such as key features, finances, skill levels of employees, company size etc. Then, you should do your groundwork thoroughly. Read some Apttus Contract Management reviews and investigate each of the other solutions in your shortlist in detail. Such in-depth groundwork can make certain you weed out ill-fitting systems and select the app that offers all the features you need for business success. How Much Does Apttus Contract Management Cost? 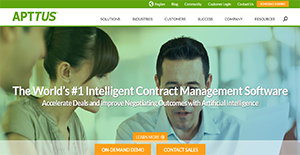 Apttus Contract Management is an industry-leading contract management solution that is powered by intelligent recommendations and processes through Max the AI. Organizations interested in the solution can request for their enterprise pricing information by phone, email, or web form. We realize that when you make a decision to buy Contract Lifecycle Management Software it’s important not only to see how experts evaluate it in their reviews, but also to find out if the real people and companies that buy it are actually satisfied with the product. That’s why we’ve created our behavior-based Customer Satisfaction Algorithm™ that gathers customer reviews, comments and Apttus Contract Management reviews across a wide range of social media sites. The data is then presented in an easy to digest form showing how many people had positive and negative experience with Apttus Contract Management. With that information at hand you should be equipped to make an informed buying decision that you won’t regret. What are Apttus Contract Management pricing details? What integrations are available for Apttus Contract Management? If you need more information about Apttus Contract Management or you simply have a question let us know what you need and we’ll forward your request directly to the vendor.